FILE - A Somali woman carries wood to make a shelter in an internally displaced people (IDP) camp, Dec. 18, 2018. "The majority of forcibly displaced are a result of violent conflict. So, we need to address the root causes of conflict in the continent," he said. "We have to address inequality, poverty, unemployment that generate tension in the continent. ... A lot of political violence comes as a result of [the] election, so we need to address the issue … to make sure that the elections are democratic, credible and peaceful." 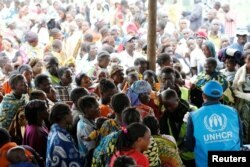 FILE - A U.N. worker monitors Congolese refugees upon arrival at a settlement camp in Kyangwali, Uganda, March 19, 2018. UNHCR's representative to the African Union, Cosmas Chanda, hopes participants at this year's summit can work to make it easier for refugees to return home. "We are talking about annexes of 17 million people … displaced in the continent. That by itself [is] very depressing," Chanda said. "We would like to see a situation which people return to their places where they normally stay. We would like to see a situation where further displacement [is] prevented." The U.N. says Uganda hosts 1.4 million refugees, the world's second largest refugee population after Turkey. Most refugees in Africa come from South Sudan, where 2.4 million people are displaced. The world's newest nation is third in the number of refugees, after Syria and Afghanistan.